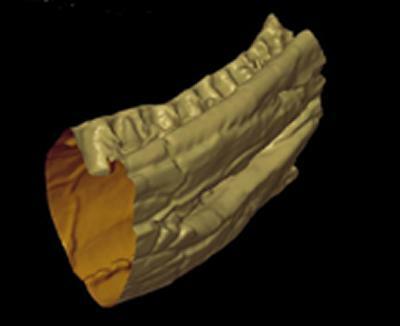 A new high-energy, high-resolution CT scanner at the University of Southampton is helping to reveal the secrets of a prehistoric sea creature. Engineering scientists at the University have been working with palaeontologists from Dorset County Council to x-ray a 2.4m-long fossil skull, which was unearthed on the Jurassic Coast. They are using the state-of-the-art scanner to create 3D images of the fossil, thought to be one of the biggest pliosaurs ever found. The pliosaur skull is one of the first items to be scanned in the University's new £2.2million multi-disciplinary 'µ-VIS' Centre for Computed Tomography. Funded by the Engineering and Physical Sciences Research Council (EPSRC), the centre will enable scientists to reconstruct, or literally see inside, a tremendous range of objects. "This remarkable equipment enables us to create digital 'slices' of all kinds of items without dissecting or damaging them," explains centre director Professor Ian Sinclair. "The scale and design of the scanner means we will be able to x-ray objects as large as a car engine down to something the size of an ant's head. "It has implications for research applications in Engineering, Biomedical, Archaeological and Environmental Science, addressing many critical current human needs in areas such as energy, climate change and the origins of lifelong health." The centre encompasses five complementary scanning systems supporting resolutions down to 200 nanometres and imaging volumes in excess of one metre; from a matchstick to a tree trunk. It will support researchers from across the University, involving over 40 academics.